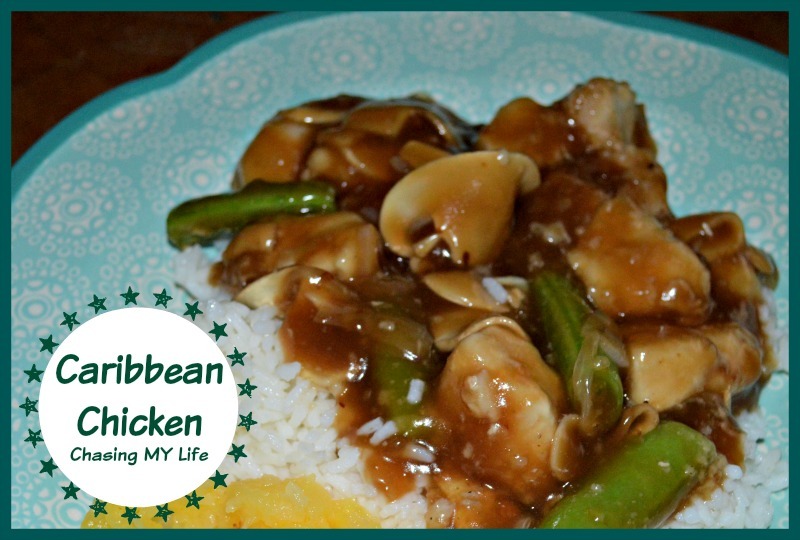 This recipe was designed after one of hubby’s favorite dishes at the Cheesecake Factory, SWEET & SOUR CRISPY PINEAPPLE CHICKEN & SHRIMP. In a saucepan combine the orange juice, pineapple juice, and sesame ginger dressing bringing to a boil. Reduce heat and add balsamic glaze and honey, cooking until slightly reduced. Whisk together the cornstarch and water. Dredge chicken and shrimp pieces in rice flour, shaking off the excess. Heat avocado oil in skillet over medium high heat until sizzling. Saute’ chicken pieces until cooked through. The add shrimp pieces and cook through. Remove chicken and shrimp pieces and keep warm. Whisk cornstarch mixture into sauce and cook through until slightly thickened. Add green onions, peppers, snow peas and mushrooms to the pan you just took the chicken from sautéing until softened. Add pineapple and sauce to vegetables, stirring to coat. Add in chicken pieces, tossing to coat. NOTE: Use the drained juice to make yourself a cocktail.